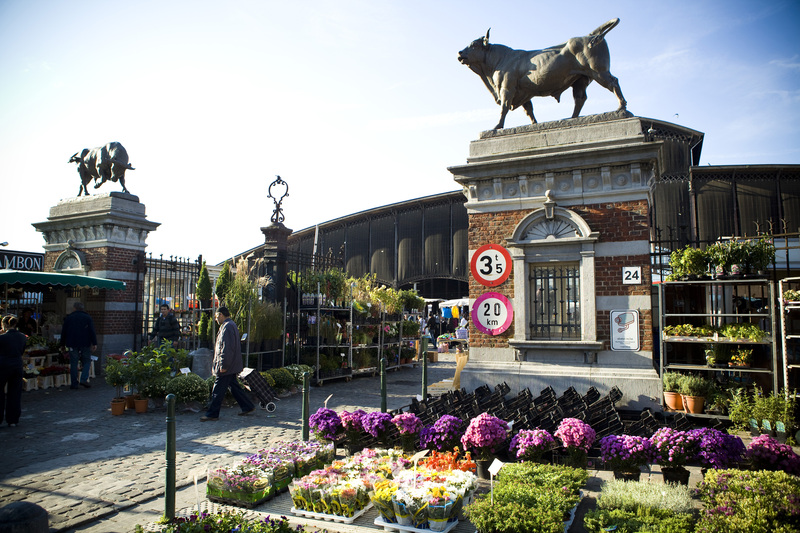 The weekly public markets on the site of the Anderlecht abattoir never fail to attract tens of thousands of keen visitors to this attractive crowd-puller. Its appeal stems from a combination of factors, including the rich history of the site. Furthermore, the architectural beauty of the listed main building and its characteristic outbuildings; the multicultural, colourful stalls and the enormous variety of merchandise on offer, ensure that every visit turns into a delightful experience.
. Even on holidays, the markets are always taking place ! On Sundays, it is stronly recommend to use public transport instead of your car. Two metrostations are located close to the market. We wish you all a merry Christmas and have a good time! Since 2015, a new Food Hall has been opened: THE FOODMET, your tasty Food Market. Leave your umbrella at home. In the covered FOODMET the weather is always great ! The enjoyable, relaxed atmosphere; the cheerful hustle and bustle, occasionally drowned out by voices of enthusiastic market vendors extolling the virtues of their wares, or insisting that you taste from the richly displayed snacks; all these aspects make it all the more inviting. There is only one word for it: unmatched! Our butcheries in FOODMET are unique! Nowhere else in our country you can find a meat market like ours. Here, private persons can buy fresh meat at the lowest price. The choice is enormous. More than 17 butchers offer their top quality merchandise, and it does not matter how much you buy to get the best price. Looking for fish? Visit the FOODMET, for connoisseurs only! The fishmarket holds some small surprises every now and then, as you can see for yourself. Chefs of Brussels top restaurants know their way around here and are regular customers. But there is much more to be found here! Stop by and take your time to discover the wealth of fresh products for sale. Wanna bet you'll come back for more! You have a stall of your own and would like to join us? No problem. As no community is complete without house rules, the same goes for Abattoir. We therefore advise you to consult them first, as everyone prefers it when business runs smoothly and well on the basis of just a few clear agreements.This site contains everything you need to know and do in order to become part of our market community, and a whole lot more. In the meantime, welcome! In everything we do, we make every effort to act as professionally and correctly as possible. This involves anticipating your questions. Here are a few frequently asked questions that we have already answered for you. If you are still unsure about anything, or stuck with a question, please feel free to get in touch. In the event of the latter, we will add your question to the list. Many thanks in advance.